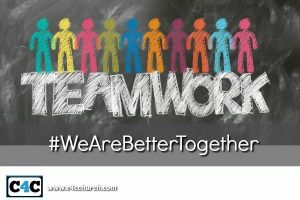 Archives | Champions 4 Christ Inc.
We are better together. We are a better couple when we come together. We are a better community when we come together. We are a better church when we come together. Where we are today is not a guarantee of where we will be tomorrow. One of the things in Scripture is its honesty about our future. The bible lets us know, that all of us are going to experience a certain amount of pain, trials, and tribulations in this world. Some of the things we never expected to happen, happened. We never thought we would lose our job. Never thought we’d flunk a grade. Never thought our kids would get hooked on drugs. Never thought our boyfriend or girlfriend would dump us. Never thought we would be divorced. Never thought we’d end up in jail. Never thought we’d be betrayed. Never thought we’d be victim of a horrible crime. Never thought cancer would invade our bodies. Never thought we’d get pregnant. Never thought we’d become an addict. Yet somehow they did happen. When these crises happen, we need to have somebody to help us get back up again. When we are in fellowship in a small group of God’s people, we can find the support and encouragement we need to make it through these situations and stand up tall for God once again. God can use any experience you’ve gone through for His honor and glory. Unfortunately, we try to hide the painful things we have gone through and pretend all is well and always has been. There is somebody you may know who is just going into what you have already been through and come out of victoriously. You could make all the difference in his or her life.